When people think about bus tracking software, it can be difficult to imagine exactly what happens as the app inputs and outputs data for parents, transportation departments, and school officials. 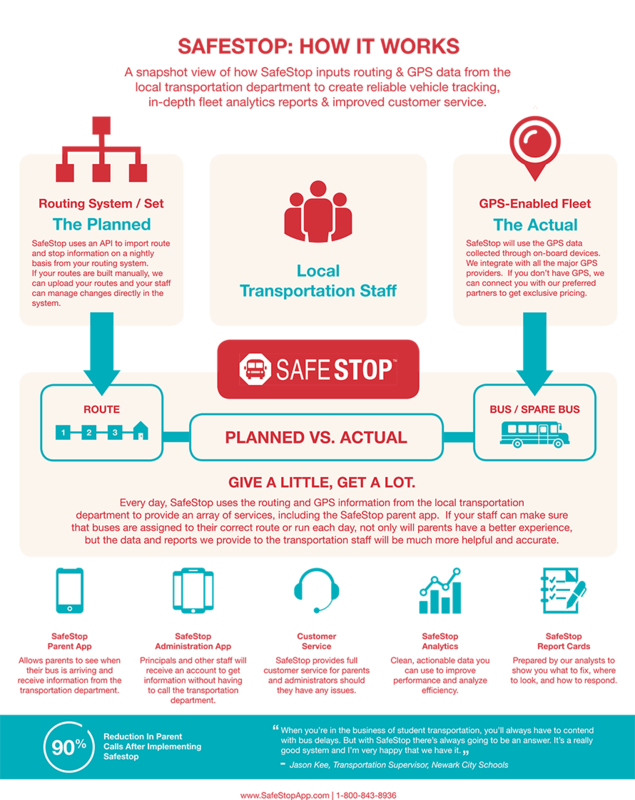 SafeStop produced an easy-to-read infographic that gives a snapshot of how routing and GPS data from local transportation departments create a reliable vehicle tracking system for everyone involved. On the local side, transportation staff in the school district maintain their routing and scheduling systems on a regular basis, which feeds data into SafeStop’s system to create tracking updates, in-depth fleet analytics, and customer service information. Each night, SafeStop imports updates about routes and bus stops — the “planned” data — and pairs it with GPS data from devices on-board the school buses — the “actual” data — to continually update the app. At the same time, the SafeStop Analytics platform uses an application programming interface, or API, to mine both sets of data to inform transportation staff about its school bus fleet, including speed, location, and expected arrival times at bus stops. Potential hiccups occur when the planned data and actual data conflict, and pick-up/drop-off times may vary based on what school buses are actually doing on the road. If students aren’t at a stop for instance, a bus may arrive early at the next stops. If a bus is out-of-service for repairs, a replacement bus goes on the road in its place and information about the replacement vehicle must be sent to SafeStop for the app to be updated. When the planned versus actual routes correlate and run smoothly, parents can be assured about the correct pick-up/drop-off times, transportation staff can have more accurate and helpful reports, and administrators can keep an eye on their customer service, school fleet efficiency, and transportation budget. Every day, if local transportation staff can ensure that buses are assigned to their correct routes, SafeStop is able to offer tracking capabilities on the parent-facing app, analytics on the administration backend, full customer service for parents and administrators alike, and report cards to show district leaders what to fix, where to look, and how to respond to improve school bus fleet operations.